Isando, 2 x Power Xpert 9395 1100kVA in TEM1, 4 x Power Xpert 9395 550kVA in TEM2, 2 x Power Xpert 9395 550kVA and 2 x Power Xpert 9395 275kVA in TEM 3 with an additional 2 x 550kVA’s planned for TEM 3 in Q1 2016. 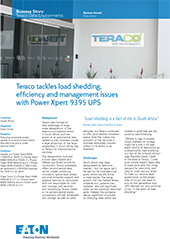 Cape Town, 2 x Power Xpert 9395 550kVA in CT1, 2 x Power Xpert 9395 550kVA and 2 x Power Xpert 9395 275kVA in CT2. The results speak for themselves: Teraco continues to dominate the large enterprise vendor neutral colocation space in South Africa. Furthermore, as a real estate business, the more efficient the energy supply is, the more efficient the business model is. As with other data center providers, the company has PUE target that it must hit for its business model to be successful – and with Eaton, it’s doing exactly that. Not bad for a system that regularly has to deal with local grids shedding load.